The Woodstock Chamber of Commerce & Industry has been a part of the Miss Woodstock pageant since 1948. Over the years, more than sixty young women have been helped with their continuing education by participating in this Woodstock tradition. We are pleased to be continuing our Little Miss Woodstock Program available to girls ages 8-12 who are a current resident of Woodstock. Our Miss Woodstock contestants must be between the ages of 16-21 and a resident of Woodstock. 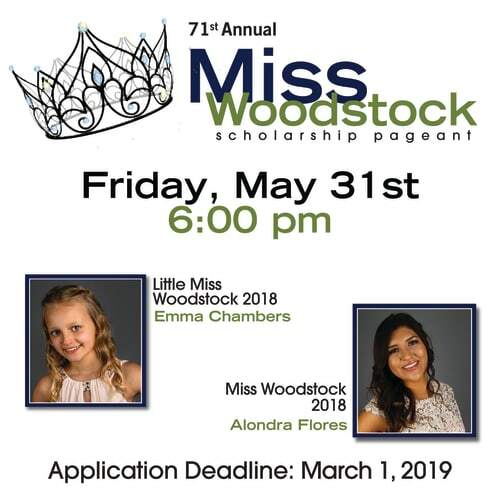 Each candidate must have a Woodstock area business as their sponsor and a $50 (Miss) & $25 (Little Miss) application fee due at application submission. Limited applications will be accepted on a first come first served basis.